A Rare 1770 “Flounder” Beautifully Renovated — SOLD!! This rare 1770 freestanding brick flounder, built well back from the street and surrounded by a formal garden with potting shed and high brick walls, is a jewel of Old Town. The two and one-half story brick home, with a rolled tin roof and beautifully renovated and restored in 1995, is one of the few remaining freestanding flounder houses in Alexandria. It features crown moldings, paneled foyer, library with original fireplace, and a full in-law suite with separate entrance. William Mitchell, a sea captain, built this ‘flounder’ house in 1770. “Flounder” means that the wall that faces the neighbor’s yard has no windows; therefore, the windows are on the other side, like the eyes of a flounder. The name is unique to Alexandria. The property originally had a warehouse in the front yard. The practice of building rear wings was common in early America. The house never acquired additional fronting on the street after the warehouse was demolished in 1815. The 2½ story brick home with a rolled tin roof is one of the few remaining freestanding flounder houses in Alexandria. The house stood vacant for eight years in the late 1980s and early 1990s. It was carefully restored in 1995. Crown moldings throughout the home were duplicated using an original 18th Century piece. 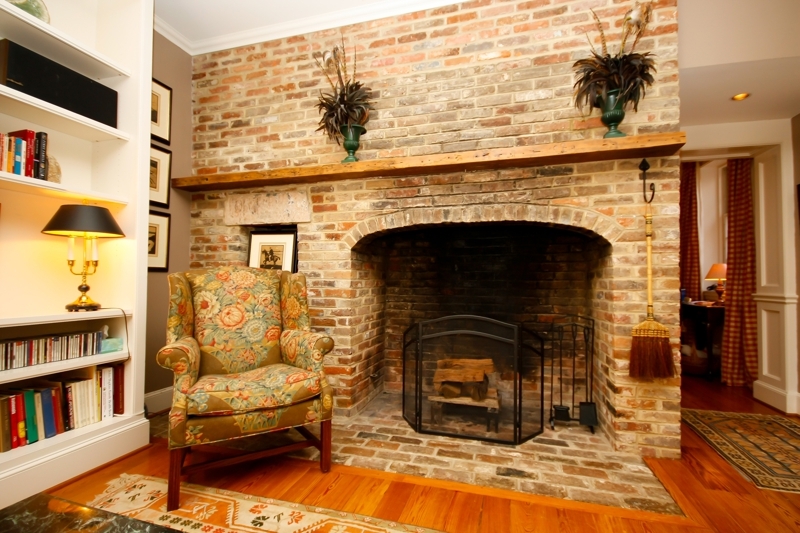 Pass through the paneled foyer to the library warmed by the original fireplace. Exit the house through the renovated kitchen and turn right in the alley to view the windowless side of the house. At the time of the renovation, the brick patio in the front yard, completely covered with mud and weeds, was unearthed. The holly tree, climbing rose, large English boxwoods on the street side of the garden, the azalea bushes on the patio’s west side, and one boxwood against the house were on the property in 1995. European hornbeams line the entry walkway to the pergola covered in wisteria and grape vines. English boxwoods frame the brick patio and dogwood tree, and a climbing hydrangea is the focal point on the front of the house. The potting shed was added in 2007. For additional details, see AX7500675 at www.HillSlowinski.com. ← The Best of In-Town Living!